Have you ever wondered how hearing aids work or if they will really help you? We think they can, so here’s our guide to help you make up your mind. There are four parts to a hearing aid. The microphone, the amplifier, the receiver, sometimes called the speaker, and the power supply. No matter what kind of hearing aid you buy, they will always have these four components. The microphone collects sound. Depending on the model of hearing aid it may have one or two microphones, or more. This allows the hearing aid to collect sound from different directions. When a hearing aid is advertised as having directional microphones it means that it has microphones pointing in different directions to collect sound from in front of you, behind you and to the side. By switching off certain microphones the hearing aid can cut down background noise behind you so your listening is focussed on sound in front of you. When the sound is collected, it is converted into an electrical signal and sent to the amplifier. The amplifier increases the volume of the sound received by the microphone. Depending on the hearing aid model it will have a sound processor that can alter the quality of the sound. Some processors can recognise speech sounds and make sound clearer, or recognise background noise and reduce its volume. They can soften sudden loud sounds or change the frequency of a sound so it’s within hearing range. When programming your hearing aid, your audiologist will use the audiogram from your hearing test to fine tune the settings so that it compensates for your hearing loss. This may mean amplifying some of the higher frequencies to bring them into your hearing range whilst keeping the lower tone sounds that you can hear well, at a comfortable volume. They can also set certain programs for you such as a background noise reduction program to help you hear speech more clearly in loud environments. Any specialist hearing requirements are programmed into the amplifier. The sound is then sent on to the receiver. This part of the hearing aid receives the electrical signal from the amplifier and converts it back into sound. This is the sound that you will hear through the hearing aid. In behind the ear models the sound is then sent via a tube to an ear mould in the ear canal. In receiver in the ear models, the receiver is connected to the amplifier via a small wire and sits just inside the ear canal. Whilst some hearing aids are now rechargeable, most still rely on batteries. The smaller the hearing aid, the smaller the battery needs to be. Whilst you may have to change smaller batteries more often, battery life also depends on other factors such as how powerful your hearing aid needs to be, and how often you use certain programs such as sound streaming. 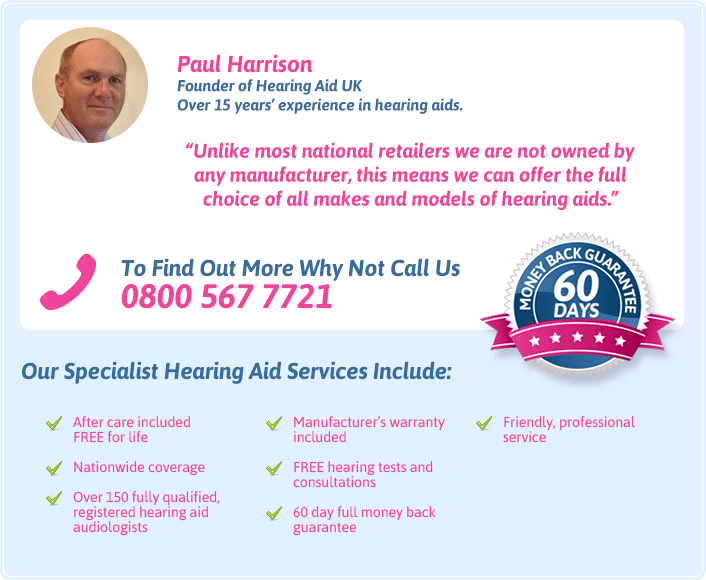 Hearing better day to day isn’t the only way hearing aids can help your hearing loss. Hearing aids can also help to prevent your hearing getting worse. How? After sound is sent through the outer and inner ear, it is picked up by the hearing nerve, which sends sound signals to the auditory cortex in the brain. This area of the brain translates these signals into sounds that we recognise and understand. Like any other part of the body, using it keeps it healthy. Studies using the MRI scans of deaf people have shown that the auditory cortex can shrink when it is not stimulated by sound. People who have had untreated hearing loss for a long time can find it hard to make sense of sounds when given hearing aids. This is because the auditory cortex is unable to identify sounds it isn’t used to hearing. Over time it can also forget what certain sounds mean. This can make speech understanding very difficult, even with hearing aids. Depending on how long someone has been without good hearing or hearing aids, the brain can learn to hear and recognise sounds again. This is why it’s so important to give yourself time to adjust to your hearing aids. Whilst age related hearing loss is progressive, wearing hearing aids can slow down the effects by keeping your hearing nerves and brain active. When you are getting used to wearing your hearing aids, you may need to go back to your audiologist for an adjustment to make things more comfortable. This will help your consultant to ensure you have the right settings for all your listening situations.